And create a great looking, healthy body! This program is ideal if have a healthy metabolism and want to lose body fat. If your metabolism is slow or you struggle to lose fat, we recommend our 12 week boost and shred program. 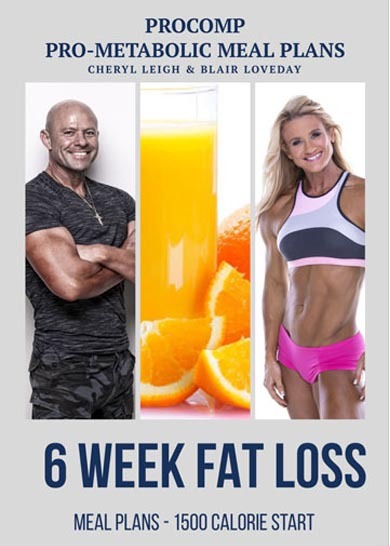 Phase 1 you will improve metabolism to set the scene for phase 2 – healthy fast fat loss. This program is ideal if you have downregulated metabolism from over-dieting, over-exercising or low carb eating. 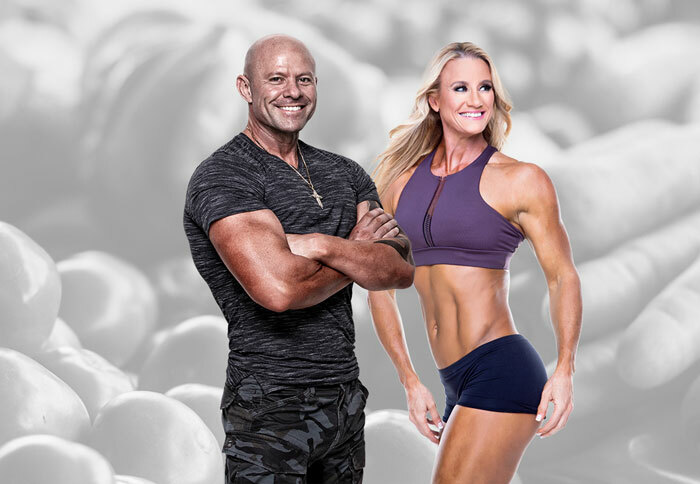 PROCOMPS PRO-METABOLIC NUTRITION PLANS A revolutionary, science-based nutrition system for faster, healthier fat loss. We are in the business of creating healthy, happy, hormonally balanced, great looking bodies. We are passionate about our Pro-Metabolic Nutrition system as it works. As coaches, we see too many dieters destroying their metabolism, health and wreaking havoc with their hormones by under eating, cutting carbs or cutting out entire food groups. It does not need to be this way. Have trouble losing weight or you put weight on easily. Experience food cravings and struggle with emotional eating. Are struggling with estrogen related issues such as PMS, PCOS or low libido? Have unsightly cellulite, varicose veins or pelvic floor issues? Struggle with feeling tired, exhausted or have a hard time getting up in the morning. Have a hard time putting on muscle or changing your body composition. Your hair is thinning or falling out? You struggle with mood issues such as irritability, anxiety and depression. You suffer from food intolerances such as lactose, dairy or gluten. Your sick and tired of eating boring, plain food and dream of eating a variety of delicious, nourishing food. Foods like fruit, juices, yoghurts, quality natural ice-cream dark chocolate and cheese. If this is you then it may be time to listen to your body. Create a great looking, healthy body without deprivation, starvation or cutting carbs. The ProComp Pro-Metabolic nutrition system is based on actual results and is backed by scientific research. We have spent years researching, learning and teaching Pro-Metabolic nutrition. Our approach focuses on being optimally healthy so that you can get into great condition. As the saying goes, do what you’ve always done to get what you’ve always got. We will show you how to break the vicious cycle, how to eat more and how effortless and enjoyable getting into great shape can actually be. Pro-Metabolic nutrition aims to increase thyroid functioning and balancing hormones. This results in an increased metabolic rate, increased protein uptake and more efficient fat burning. Our nutritional framework is based upon the work of a leading American endocrinologist and hormone researcher, Dr. Raymond Peat. The Pro-Metabolic nutritional framework will reduce cortisol, balance estrogen, support efficient thyroid functioning, stabilize insulin, reduce inflammation and encourage a fast metabolism with outstanding results. A healthy body with a fast metabolism will lose fat effortlessly. Forcing fat loss from a stressed, damaged body is a miserable experience. It is so worthwhile to invest the time to improve metabolism. The correct nutritional framework is paramount to achieving great results. Not only does it determine what you look like, it is crucial to your health, energy, immunity, digestion, mood, skin, body composition, recovery, training, and fat loss. Pro-Metabolic Nutrition will NOT destroy your health or create emotional eating or food issues. It is about supporting fat loss and not forcing fat loss. It is about eating more good quality food and NOT less. It is about balance, nourishment, health and vitality. ProComp’s Pro-Metabolic nutrition system supports fat loss and does not force fat loss it. It is nutrition that cares for your body rather than destroying your body. Nutrition that enables you to eat more rather than eating less. Nutrition that nurtures your body, rather than depriving your body. It is designed to work with your body rather than working against your body. 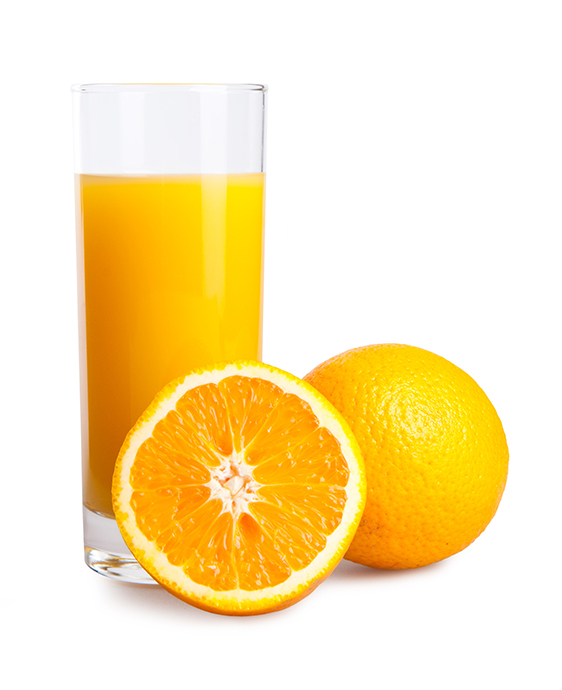 It supplies the body with enough energy and does not starve the body. It provides a variety of delicious food and does not restrict food groups. It focuses on nourishing, satisfying, delicious and restorative food. What food will I be eating on a Pro-Metabolic nutrition plan. What do the meal plans consist of? 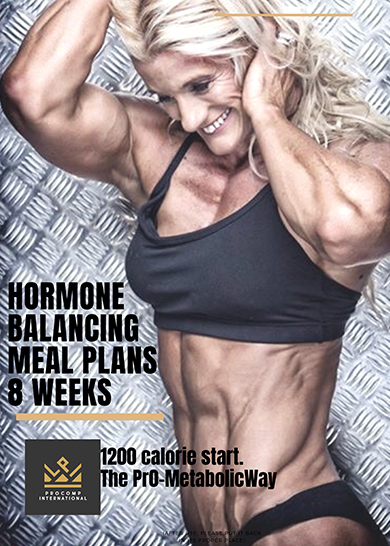 Each plan is divided into 6 meals (breakfast, snack, lunch, snack, dinner, snack) and you will have 2 options for each meal (one simple option and one recipe). Each week the meals are entirely different. We have found that best results are achieved with meals are eaten regularly throughout the day. If you are unable to consume 6 meals, then we suggest combining a snack with a main meal. The meals can be eaten in any order. Fruit smoothie from frozen tropical fruit, lite milk, gelatin and an egg. What if I have food intolerances and what about dairy? It’s important for you to be aware that all our plans contain dairy in the form of cheese, milk, yoghurt. Many lactose intolerant individuals find they do well on quality hard European cheese (no lactase), we would then suggest replacing the cow’s milk with an equivalent coconut milk option and coconut based yoghurt. The still works for most people. If you experience more chronic food intolerances, remember these are not personalised plans and you may be best suited to one of our Personalised Custom Nutrition Plans. Pro-Metabolic nutrition is different to any traditional weight loss plan. We eat MORE quality food to increase metabolism. A fast metabolism will allow you to burn fat easier and quicker, add good quality muscle, sleep better and look better. Your skin and hair will improve, your hormones will be balanced, your mood stable and you will not experience PMS, bloating, cravings, inflammation or digestive issues. You see, fat loss actually favours a fast metabolism. The nutrition system on its own works if improved metabolism, hormonal balance, greater health and fat loss are your goals. 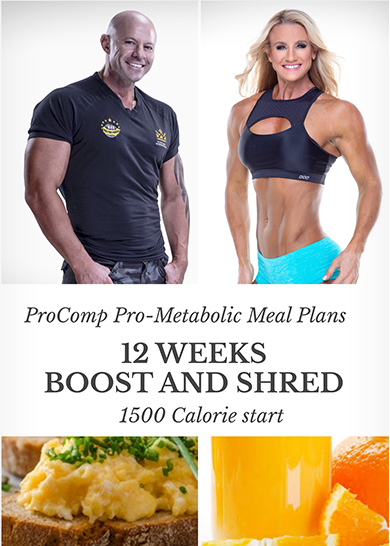 The ProComp pro-metabolic meal plan programs are online programs that will be emailed to you once you purchase them. 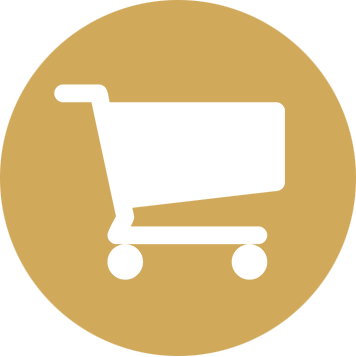 Alternatively at checkout, you can request a hard bound copy of the meal plan manual to be posted to you for an additional printing and postage fee. Your week by week program overview and notes about what you can expect. ProComps Metabolic fat loss program notes. you will learn about the thyroid and metabolism from Dr Peats research, estrogen and fat storage, how to upregulate metabolism, lifestyle and hormonal factors that impact fat loss, and specific food and nutrients and how they effect metabolism, fat loss and hormones. The ProComp Progress Review Sheets – this is the actual form we use with our athletes and nutrition clients to monitor and assess progress. We encourage you to complete this when you commence your plan and then again every week so you can track and monitor your progress. At checkout select the complete package and you will be guided to select your bonuses. Choose any 2 ebooks and any 3 training plans. This will provide you with all the information, tools, research and training necessary. You now have at your fingertips everything you need to chisel your body and create a great looking healthy physique. Simply choose which program will best suit your goals. Go to the checkout, purchase your plan and you are ready to strip the fat, feel fantastic and create a great looking, healthy body..